Objective: Given a matrix of 0’s and 1’s (binary matrix). 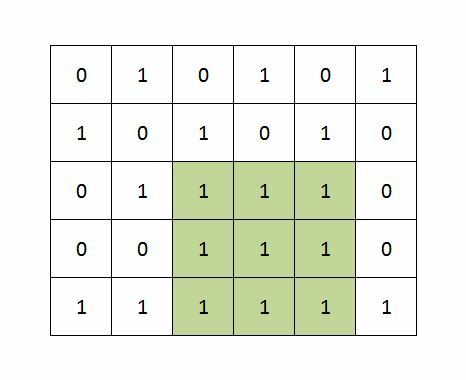 Find out Maximum size square sub-matrix with all 1’s. If only one row is given then cells with 1’s will be the Maximum size square sub-matrix with size = 1. If only one column is given then cells with 1’s will be the Maximum size square sub-matrix with size = 1. Create an auxiliary array of the same size as given input array. We will fill the auxiliary array with Maximum size square sub-matrix with all 1’s possible with respect to the particular cell. Once the auxiliary is fill, scan it and find out the maximum entry in it, this will the size of Maximum size square sub-matrix with all 1’s in the given matrix. How to fill the auxiliary matrix?? Copy the first row and first column from the given array to auxiliary array. (Read the base cases described earlier). For filling rest of cells, check if particular cell’s value is 0 in given array, if yes then put 0 against to that cell in auxiliary array. check if particular cell’s value is 1 in given array, if yes then put Minimum (value in the left cell, top cell and left-top diagonal cell) + 1 in auxiliary cell. For Given arrA, create auxiliary array sub. At the End, scan the sub and find out the maximum entry in it. 250 queries in 0.204 seconds.